Synthesizers are often associated with keyboards - many people think you need to be able to play keys to enjoy a synth. In truth, that simply isn't the case - introducing the sequencer. They may look like spaceship control panels, but don't be fooled. In this article, we'll cover how sequencers work, their most popular applications, and how you can incorporate them into your music. Sequencers allow you to program a combination of notes, rhythms, articulations and effects that can be sent to anything from your DAW of choice to hardware synths. By programming your patterns, melodies and loops, you free yourself up to experiment with mixing, dynamics and performing with other instruments. This makes sequencers a great way of expanding your live setup and exploring new sounds. Sequencers come in many different forms. Hardware sequencers often have an array of backlit buttons and knobs arranged in time signature subdivisions i.e. groups of 4, 8, 16 and so on. This makes is easier to keep track of your patterns as they’re played. Software sequencers are often presented similarly, but on a screen (obviously) – though there’s often a bit more flexibility in terms of parameters and displays. More on this later. A sequencer will usually let you determine several things. First of all, the length of your pattern; it could be a regular 16-step pattern that just repeats itself. Or you might choose to program an irregular 5-step pattern that repeats alongside your 4/4 drum rhythm – this can be used to create cool polyrhythms, a technique often used by Nine Inch Nails and similar artists. As well as this, you can determine pitches of notes. If you want your sequencer to play a melody, bassline or repeating textural part, you’ll want to choose the notes that it plays. This can be done with a knob, a set of buttons, or even sometimes a simple keybed (see the Arturia KeyStep). Sometimes you can even choose additional things like note length, velocity, rests/ties, effects and more. How do I connect a sequencer to my synth? MIDI – you’ll often see the 5-pin MIDI DIN connection on synths and sequencers. A simple male to male DIN cable will do the trick, carrying everything from pitch to articulation info in one go. CV – if you fancy getting a little more adventurous with your hardware, controlled voltage can be useful. Usually in the form of a 3.5mm jack, you’ll usually have more than 1 CV connection to play with: pitch, gate and mod(ulation). Connect these to their corresponding connections on your synth and you’re away – these are particularly useful with modular and Eurorack setups. USB – naturally this is mainly for connecting sequencers to your computer. It allows you to send info to your DAW via your hardware, giving you a more tactile approach. You can sometimes send info the other way, like pitch and tempo to keep things in sync. Are all sequencers compatible with other hardware? For the most part, yes. If they weren’t, they’d be a real pain to use and probably wouldn’t sell very well. As mentioned above, the vast majority of sequencers use pretty universal connections. This makes life a little bit easier, even when you’re using multiple brands. You might like the sound of one brand’s synth, but prefer to use a sequencer made by somebody else. As long as you’ve got MIDI or CV on each one, you won’t have any problems! 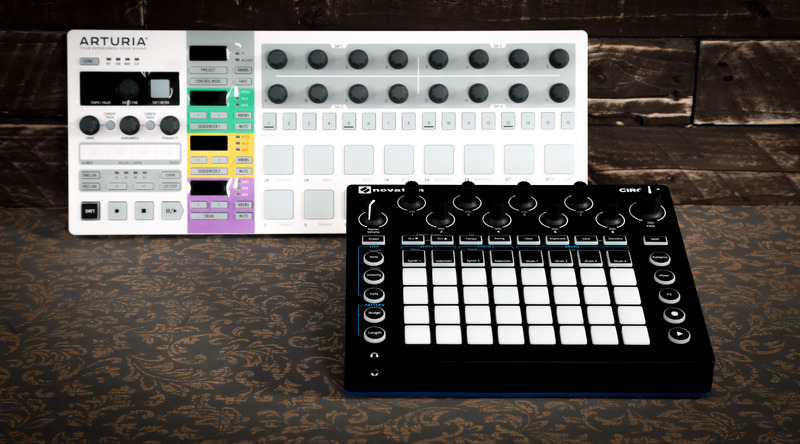 (above) the Arturia KeyStep has just about all the connections you need to connect to any setup – MIDI, CV & USB. How can I synchronise my sequencer with other hardware? This is where clock signals come into the equation. A clock is a consistent rhythmic pulse that can be sent to any/all synths or components in your setup. This pulse communicates a simple, repeating rhythm, ensuring that all synths in your setup remain synchronised in tempo. If you’re connecting via USB to a DAW, the DAW itself will communicate tempo info via said connection. If you’re going hardware to hardware i.e. computer-free, you’ll usually find a dedicated clock connection that allows hassle-free syncing. Clock connections are usually 3.5mm jacks, like CV. Connect the clock out from your sequencer to the clock in on your synth, and you’ll hear everything lock together. Clock signals can be daisy-chained too, so you can have several bits of hardware all synced together – winner. As mentioned earlier, sequencers can come in either hardware or software form. Software sequencers will often be more flexible, purely because they’re built-in to your DAW or a dedicated plugin. This usually means you’ll have more parameters to play with, more steps for longer sequences, and a more holistic view of your patterns in real-time. 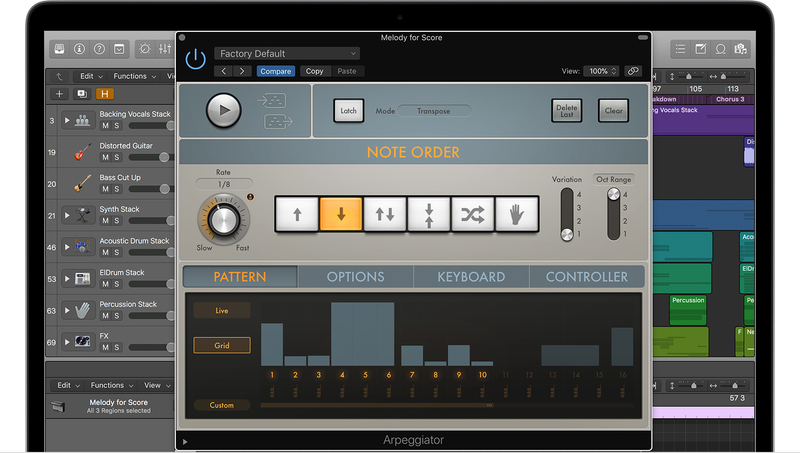 (above) Apple’s Arpeggiator plug-in is built into Logic Pro X and doubles up as a step sequencer. With hardware sequencers, however, you get the hands-on approach. You can literally reach out and interact with your sequence in real-time. Plus there’s the borderline-DIY satisfaction of getting your hardware to synchronise and play music fluidly. For more on this topic, check out our article on hardware vs software synths. A compromise would be some sort of controller. A controller is a piece of hardware that you can connect to your DAW and use to manipulate parameters of your choice. Many come pre-mapped with certain controls, but you can usually tweak which button or knob does what. This allows you to interact with your music in a similarly hands-on way while making the most of the flexibility of your DAW. What’s the difference between a sequencer and an arpeggiator? The difference is subtle but important. An arpeggiator will take a group of inputted notes (from a keyboard or another MIDI source) and split them up into a repeating rhythmic pattern. Arpeggio, noun: the notes of a chord played in rapid succession, either ascending or descending. Some arpeggiators allow you to choose ascending, descending or other pattern shapes, as well as octave range, note length variation and more – all of which is designed to give your arpeggios a bit of movement and variety. A sequencer allows you to determine all of this and more, without the need for any external note input. This makes them a little more flexible, in that you can truly tailor your parts to suit your mix. What can you use sequencers for? Drum patterns – program in-depth rhythms that can be tweaked on the fly. Send the info to a variety of different hardware to experiment with different rhythmic sounds. Basslines – using a sequencer to play your basslines frees you up to experiment with other parts of your mix. Experiment with chords over the top, change the melody up – or even just tweak the bass tone as it plays for that dynamic, human edge. Melodies – strip your melody down to a repeating pattern and let it breathe. Some might argue that a melody only really comes into its own once it’s combined with the right backing. If you let your sequencer take care of melodic parts, you can experiment with the necessary accompaniment. Weaving rhythmic textures – sequencers are, by nature, rhythmic tools as well as melodic. Utilise this by choosing irregular step counts (like 5, 7 or 9) to create interesting polyrhythms within your music. Crank the subdivisions (or ‘rate’) up so that your sequence plays at superspeed – this creates a cool fluttering effect (check out the intro to the ‘Stranger Things’ theme tune below). Add reverb and/or delay to your repeating pattern to create ambience that moves and flows with your mix – so many options! There you have it – that’s what a sequencer is. Better still, you’ve got a few ideas in terms of how you can use them; how they’ll fit in your setup, and how they’ll help you make music! Check out our full range of sequencers here. If you enjoyed reading this piece, check out the rest of our super-handy learn content right here. Thanks for stopping by!